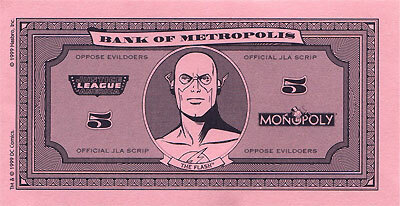 Today we’ll be looking at the Monopoly Justice League of America Collector’s Edition from 1999. 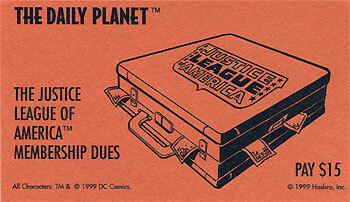 This was a great piece produced by USAOPOLY representing the Silver Age Justice League. 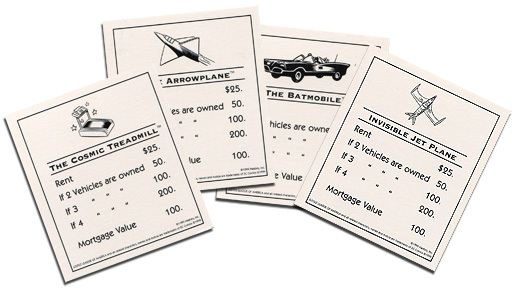 The premise of the game is identical to Monopoly, the difference being simply in what things are called. 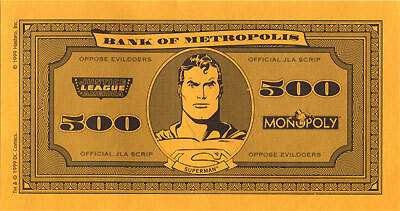 Instead of the properties being named after places in Atlantic City, they are named after Justice League member’s abilities. 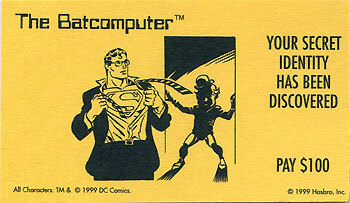 For example, instead of “Boardwalk” and “Park Place”, you have “Strength of Steel” and “Heat Vision”. 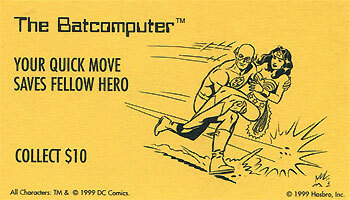 Below is the box cover. 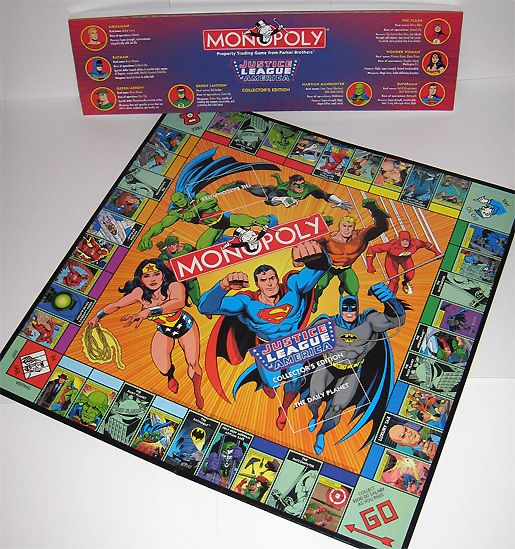 Below is a shot of the game board and the insert explaining the characters. To see all the properties, click the image below to enlarge (big image – 1.4 MB). 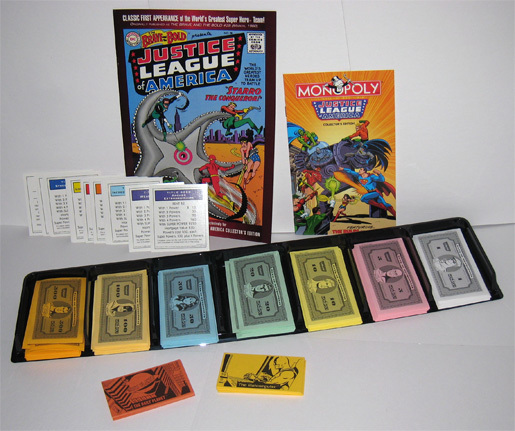 Below is the bank, some of the Title Deed cards (called “Power Cards” in this edition), the “Chance” and “Community Chest” cards, a reprint of The Brave and the Bold #28 (the first appearance of the Justice League of America), and the instructions. 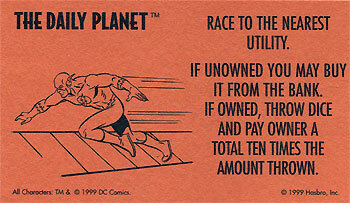 Below are the replacement Utilities cards. 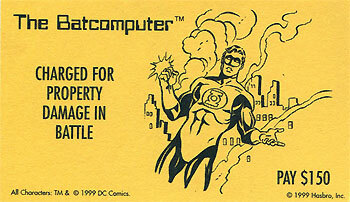 Instead of the “Electric Company”, you have “Green Lantern’s Power Battery”. 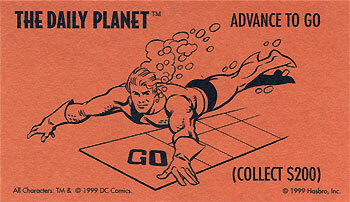 Instead of “Water Works”, you have “Aquaman’s City of Atlantis”. 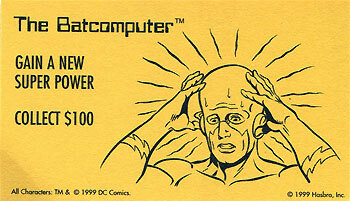 Below are the replacement Railroad cards. 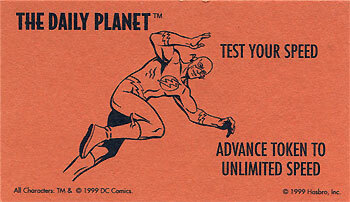 In this set you’ve got: Flash’s “The Cosmic Treadmill”, Green Arrow’s “The Arrowplane”, Batman’s “The Batmobile”, and Wonder Woman’s “Invisible Jet Plane”. 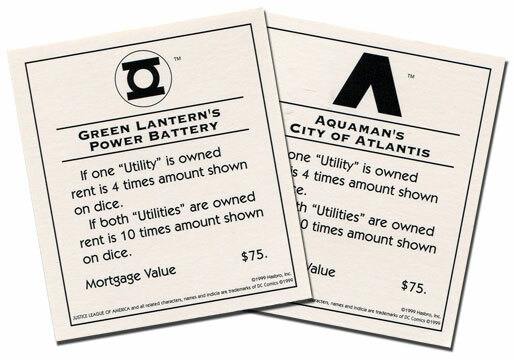 Below is a shot of the player tokens and the houses/hotels. 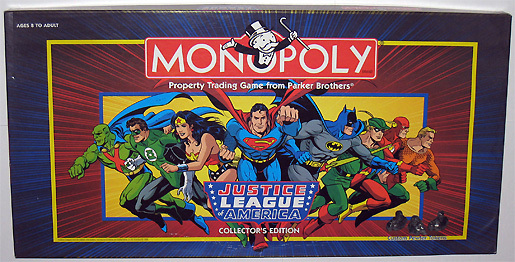 In this edition, green houses are replaced by blue “Powers”, and red hotels are replaced by red “Super Powers”. 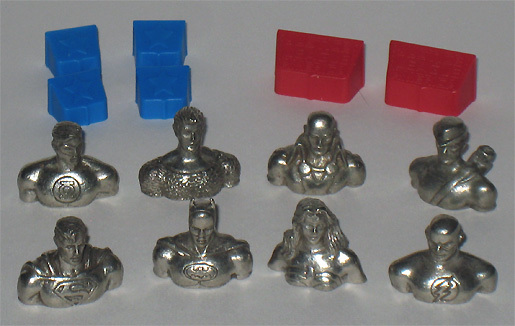 Here is another shot of the pewter player tokens. 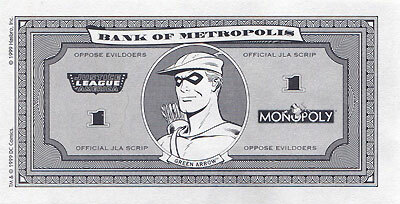 They include (from L to R): Superman, Green Lantern, Batman, Aquaman, Wonder Woman, Martian Manhunter, Flash, and Green Arrow. 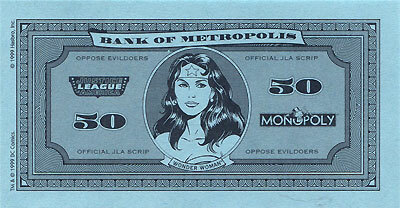 Here is a better shot of the “Powers” and “Super Powers” pieces. 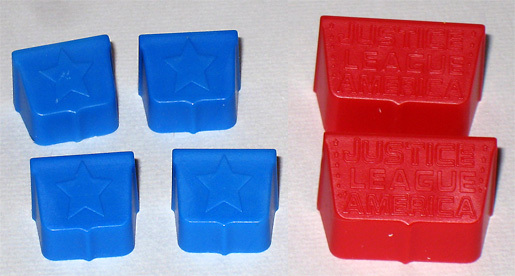 You can see the star on the blue pieces, and you can see the Justice League of America logo on the red pieces. 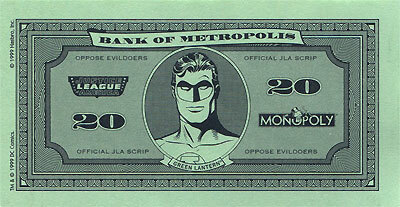 Here is the JLA currency for the game. 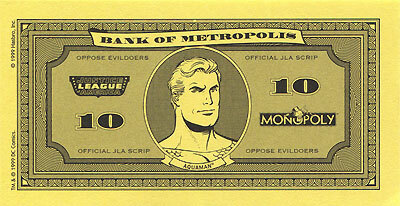 Poor Martian Manhunter, everyone else got a bill except him. 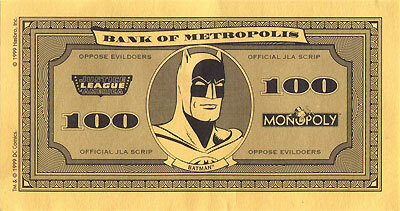 Maybe he’s on the three dollar bill. 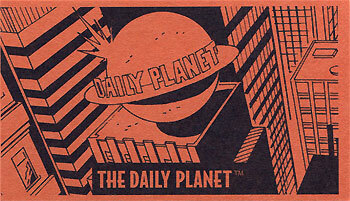 The orange “Daily Planet” cards replace “Chance” in this edition. 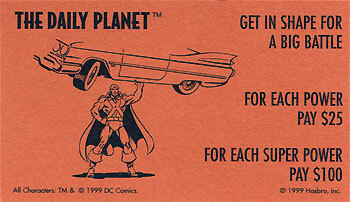 Below are some of my favorite “Daily Planet” cards. There are tons more, these are just the ones I chose to feature. 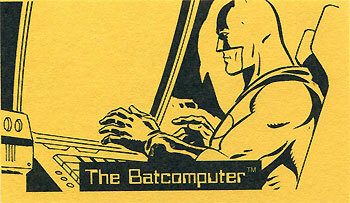 The yellow “Batcomputer” cards replace “Community Chest” in this edition. 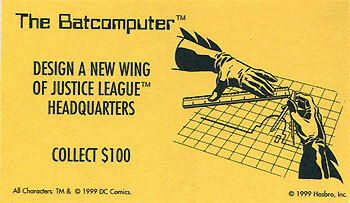 Below are some of my favorite “Batcomputer” cards. There are tons more, these are just the ones I chose to feature. 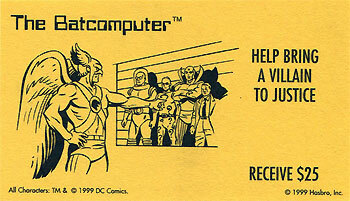 It’s interesting that Hawkman and the Atom managed to sneak into the game on these cards. 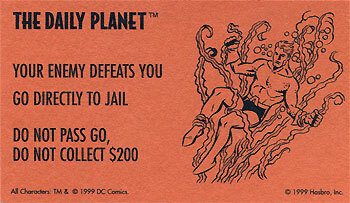 What a cool version of Monopoly! 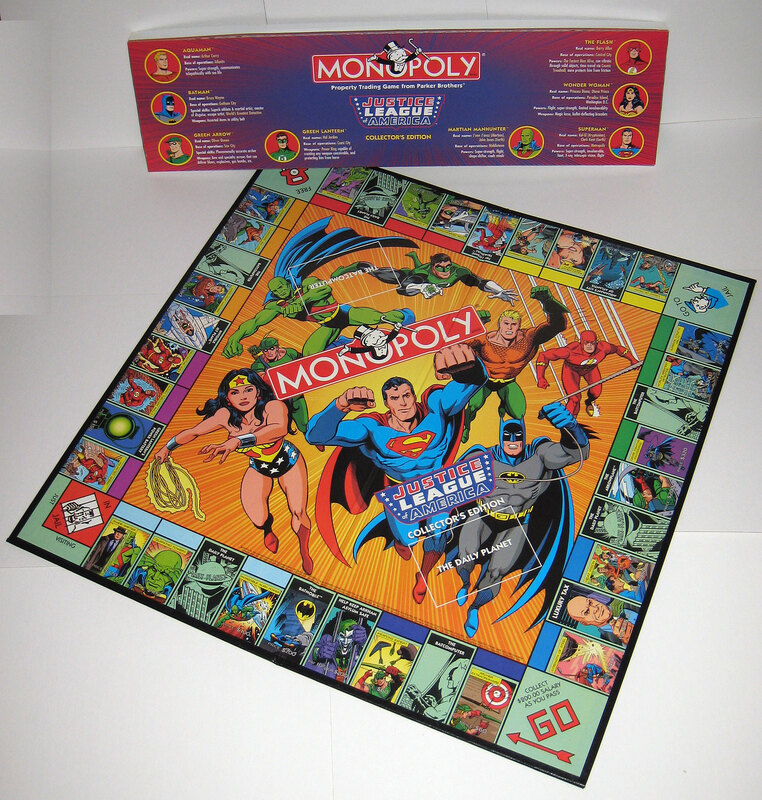 It definitely puts a fun spin on the game for us comic geeks. That looks really nice. My wife is a big Monopoly fan, and if we didn’t already have multiple versions of the game, I might be able to talk her into it. 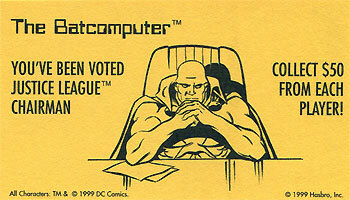 I like seeing the Martian Manhunter featured so prominantly, even though Hawkman isn’t. That’s awesome! I’ll have to look into picking it up once I am gainfully employed again! 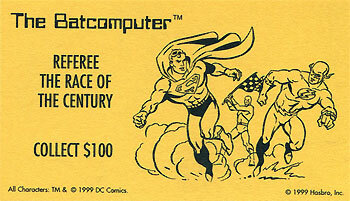 I actually got this when it was released because I loved the silver age interpretations of the characters. It’s a great set. 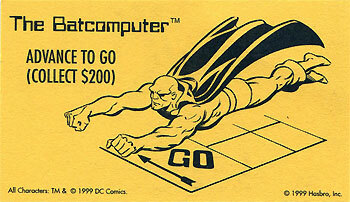 oh that looks like a fun game. wouldnt mind playing it a few times. 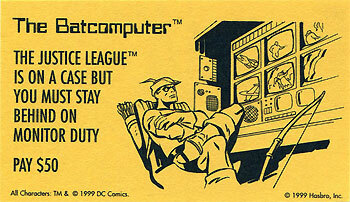 i have one of these. i would love to sell it, is anyone interested. 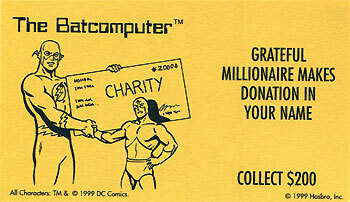 i’m raising money for Team for Kids charity. Interested in hearing from you. I appreciate it.